How many donuts are in that big box? What are the dimensions of the box? Is there more than one layer of donuts in the box? How many rows of donuts are there? 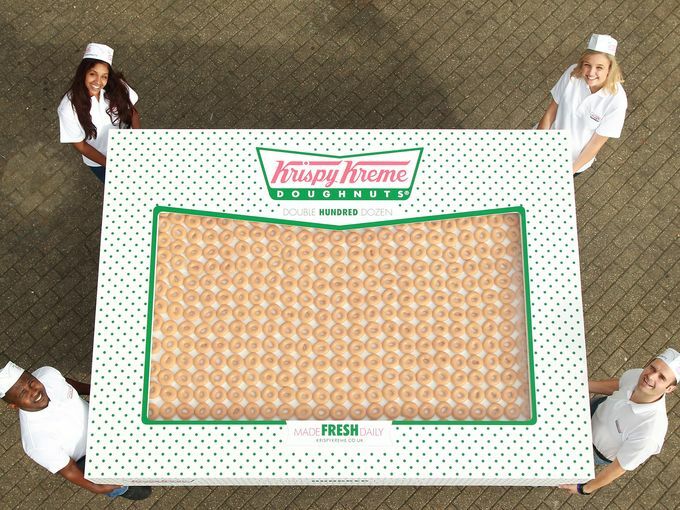 How big is (What is the diameter of) a Krispy Kreme donut? When I was finished (or thought I was finished) wondering, I began to seek the information needed to answer my questions. I found some nice strategies for determining the number of donuts in the box. Strategies accessible for 4th grade students. I was happy, so I moved on to the next question: What are the dimensions of the box? I looked at the pictures, found the information in the article, then began to question that information (and myself) as well as some critical friends. This problem was getting better and better as I walked myself through it. Fantastic! SMP 3: Construct viable arguments and critique the reasoning of others, such as a Krispy Kreme representative from the UK or a USA Today reporter. Maybe this question won’t have a third act, but the estimation and reasoning used to solve this could be extremely empowering for kids. Time for me to give this a try! More in about a week. By the way: Krystal Shaw gave her amazing Mathletes after school club the task of writing a 3-act math lesson for their teachers to teach. 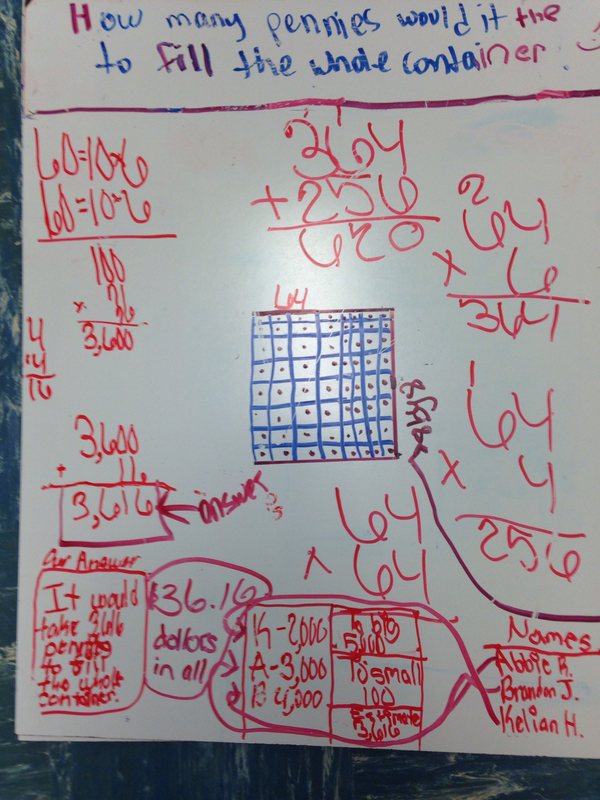 I think she should post it on her blog to share with the MTBoS! Students see a video and notice a bunch of things that teachers don’t even realize are there. The curious questions students ask first are often “why” questions. There’s no way to predict everything a group of students might wonder. We could look for expressions (on faces – I found out later that this student was thinking about context. A person’s facial expression can tell a lot) Unfortunately, there were no facial expressions in this video. Stay focused on the clip. Try to remember as much as you can. I had never done this before, but after hearing their ideas, I will be using this again. What’s missing from this picture is the wonderful reasoning given for some of these. 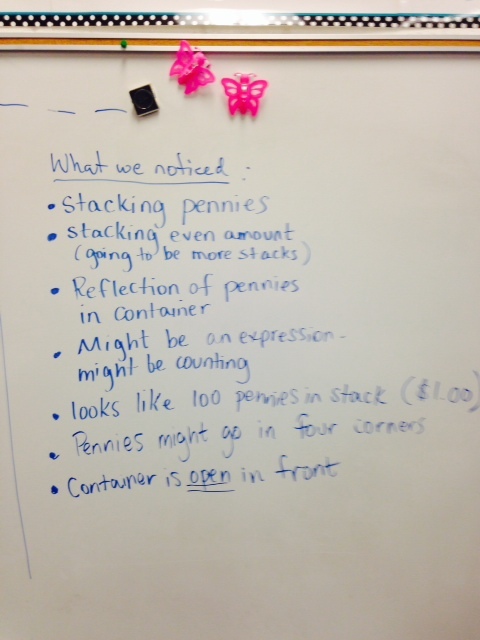 For the last bullet, “container is open in the front,” the student told the class that it was open in front so the pennies could be placed in the container more easily (I never thought they’d see or think about that). They even began to wonder a bit here – “it might be an expression or it might be counting.” My favorite, though, is the estimation by the girl who said “it looks like 100 pennies in the stack ($1.00).” This was particularly interesting to me because of what happened when they were asked to estimate for the focus question. In my limited (yet growing) experience with teaching using 3-Act tasks, I’ve noticed that the wonders are initially “why” questions (as stated in number 2 above). 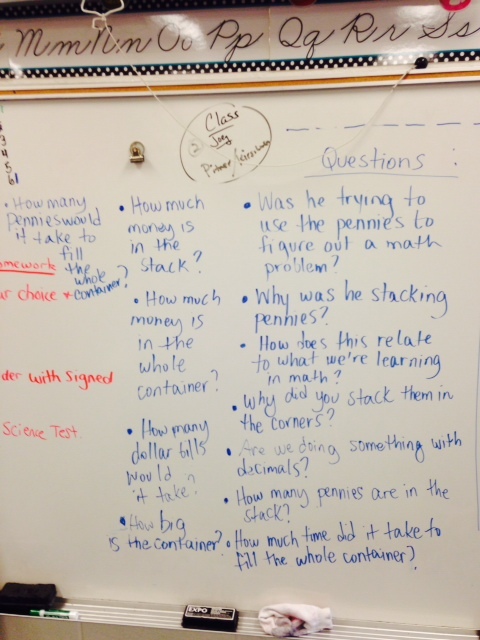 I told the class that I noticed that the questions they were asking were mostly “why” questions. I asked them what other words could be used to begin questions. Rather than trying to steer students to a particular question, I decided to focus the students’ attention on the kinds of questions they were already asking, and guide them to other types of questions. It didn’t take long! 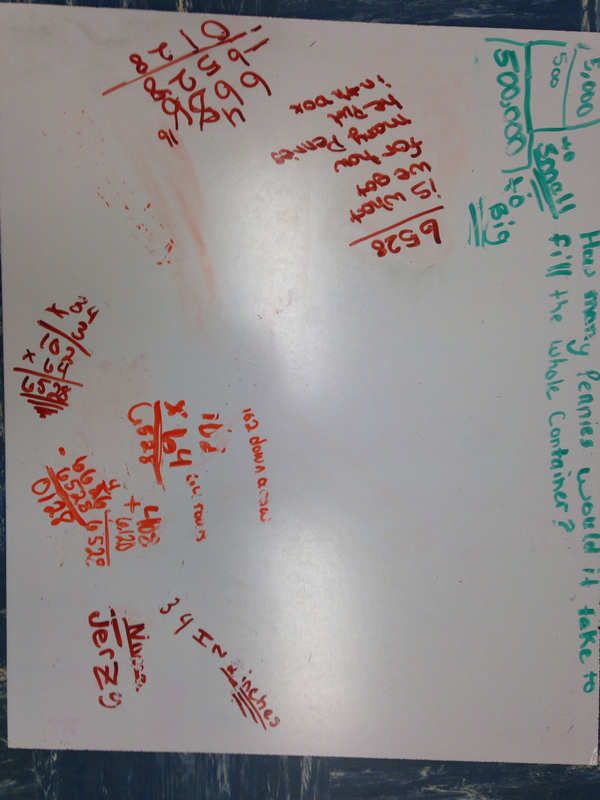 Within about 5 minutes, students had gone from “why” questions to “how many . . .” and “how much . . .” questions which are much easier to answer mathematically. 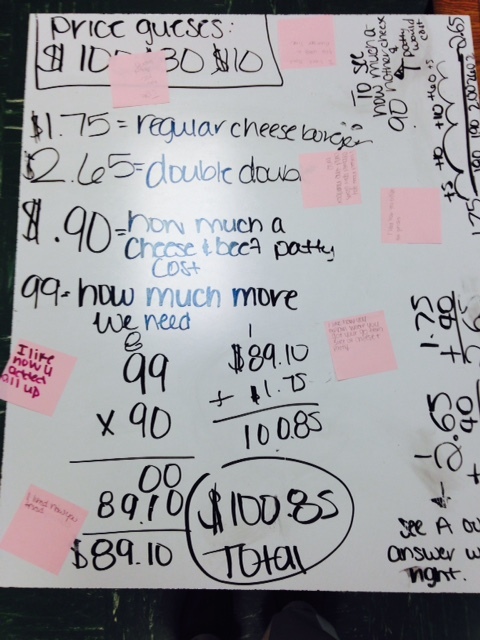 The students were then asked to figure out what they needed to solve the problem. 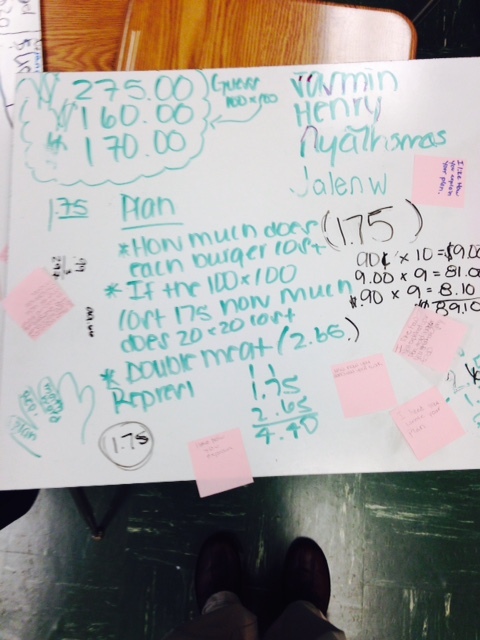 From experience with this task, I knew that most students would want pennies, so I had some ready. I didn’t give them the Coin Specifications sheet, because no one asked for it. I did have it ready, just in case. Every group asked for pennies and rulers. I wasn’t sure how they would use them, but I was pleasantly surprised. 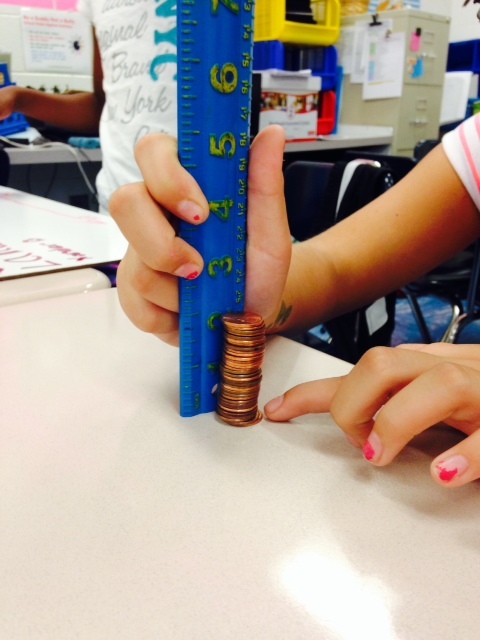 How many stacked pennies in 2 inches? The students all started in a place that made sense to them. Some wanted to figure out how many in the stack, so they stacked pennies and quickly realized (as I did when filling the cube) that you can’t stack pennies very high before they start to wobble and fall. So, they measured smaller stacks and used that info to solve the problem. 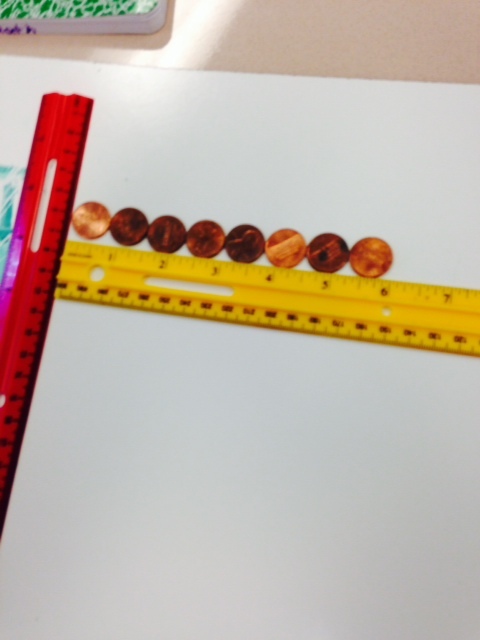 Others wanted to find number of pennies along an edge to find how many cover the base, then work on the stacks. Students were thoroughly engaged. 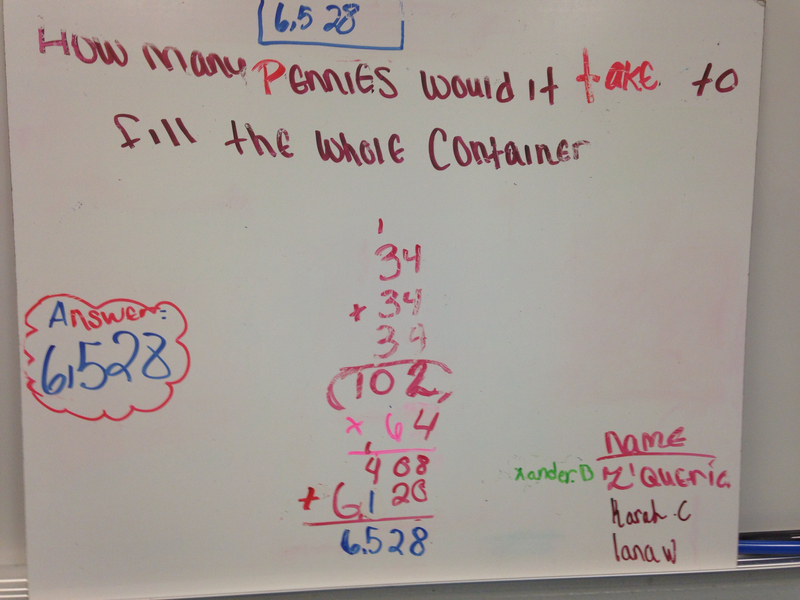 One group was unsure of whether to multiply the number of pennies in a stack by 12 (6 inches + 6 inches) or to use 64. 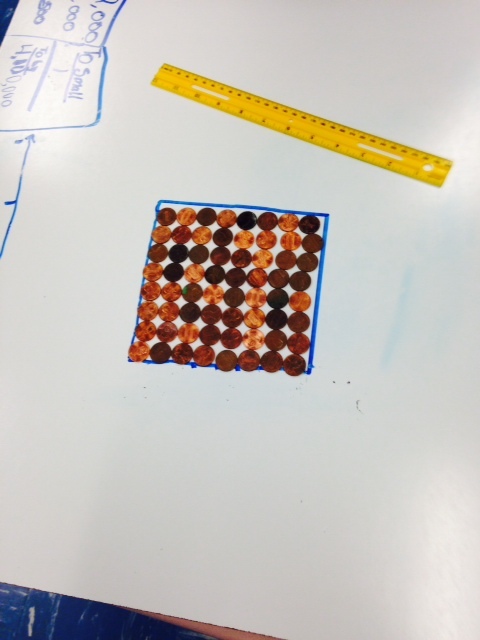 Another group found the number of pennies to cover the base and multiplied it by itself to get their solution. 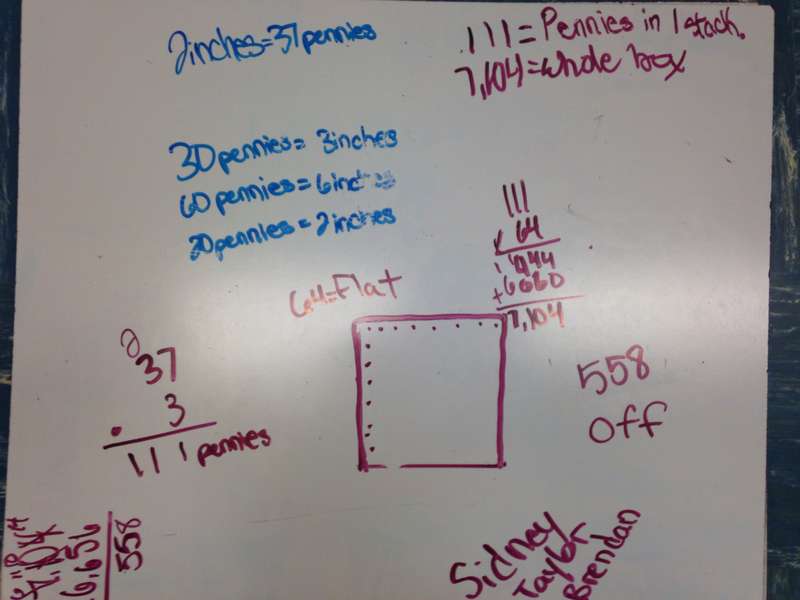 A third group found 37 pennies in 2 1/2 inches and was having a difficult time handling that information. 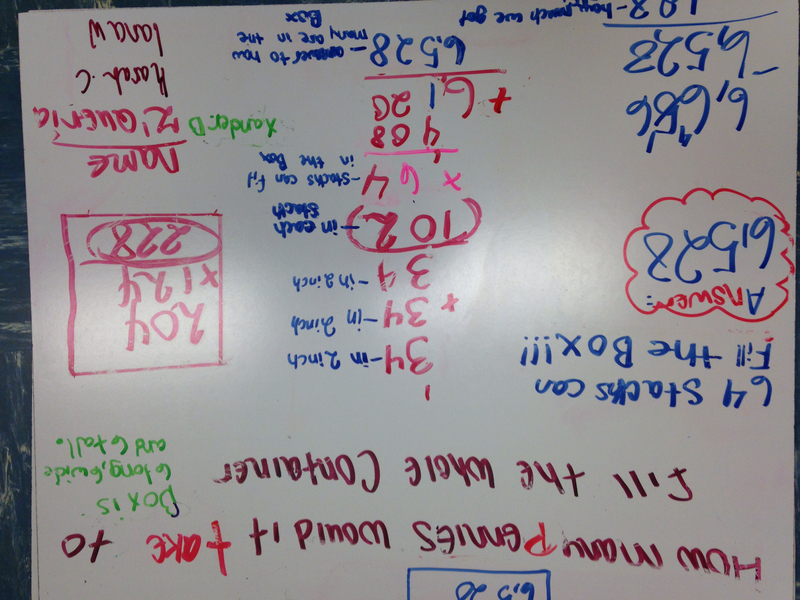 A fourth group had come up with two different solutions and both thought they were correct. Only one could defend her solution. 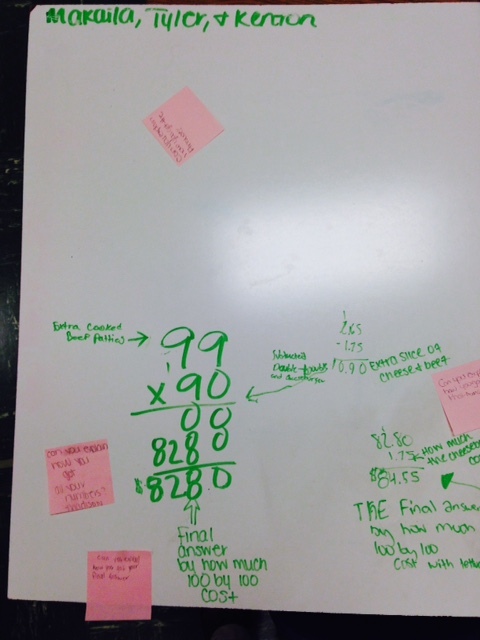 Eventually, several groups arrived a solution that made sense to them. I chose one group to share. This group had a reasonable solution, but their method and numbers were different from many of the other groups, so this is where we were hoping for some light bulbs to begin to glow a bit. The math (computations) are written neatly and they’re easy to follow. I know what their answer is because it has a bubble around it. The question is on it. Where did you get 34? What does the 102 mean? Any suggestions for this group to help them clarify their work to answer some of your questions? Maybe they could label their numbers so we know what the numbers mean. Maybe they could have a diagram to show how they got a number like 64 or 34. I know that would help me (this student had a diagram on his work and thought it was useful). The light bulbs really started to glow as students began making suggestions. 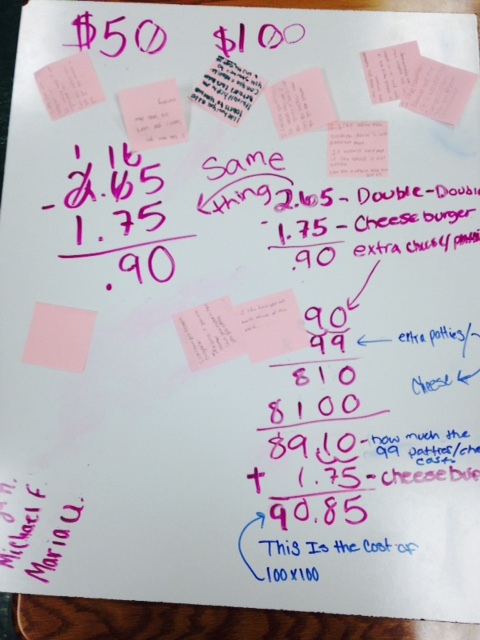 As soon as a suggestion was made, students began to check their own work to see if it was on their work. If it wasn’t, they added it. All of the suggestions were written on the board so they could modify their work one final time. The best part about this whole exchange was that students were suggesting to their peers to be more precise in their mathematics (SMP 6 – Attend to precision). And, they really wanted to know what 34 was because they didn’t have that number on their boards (which is why I chose this group). Now for the reveal! 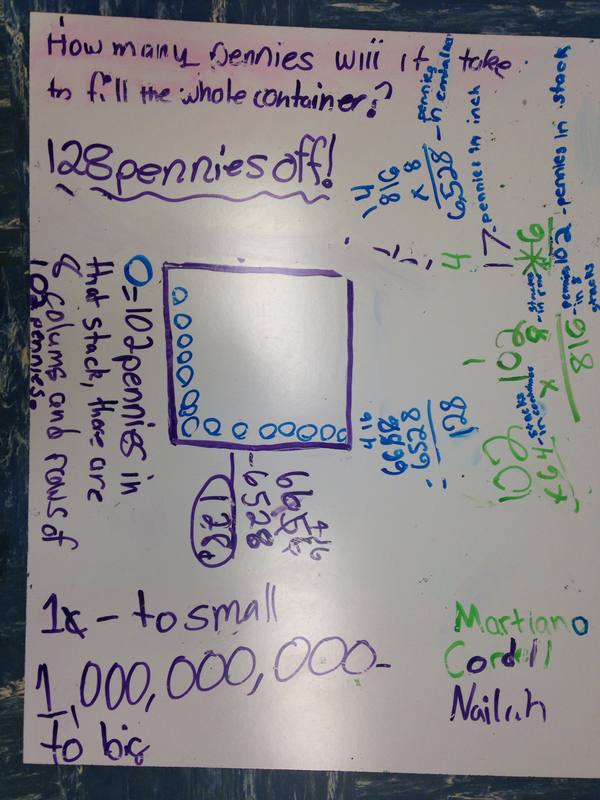 When I asked the class if they wanted to know how many pennies were in the cube, they were surprised when I pulled up the reveal the video. I guess they thought I’d just tell them (that’s so 1980’s). They watched to see how close they were and when the total came up on the screen, many cheered because they were so close! 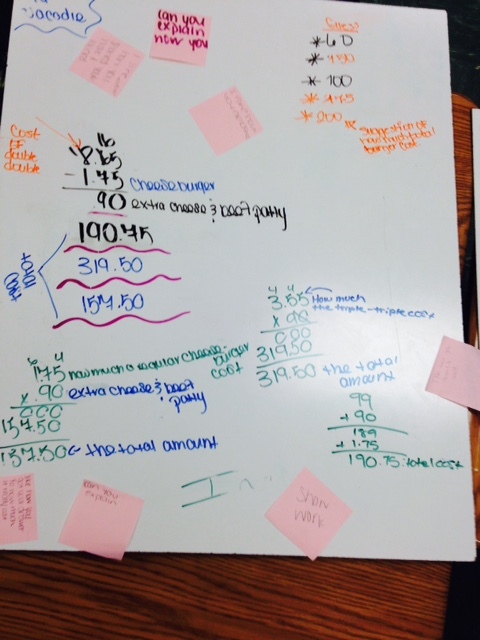 The students in this class were engaged in multiple content standards over the course of 3 days. 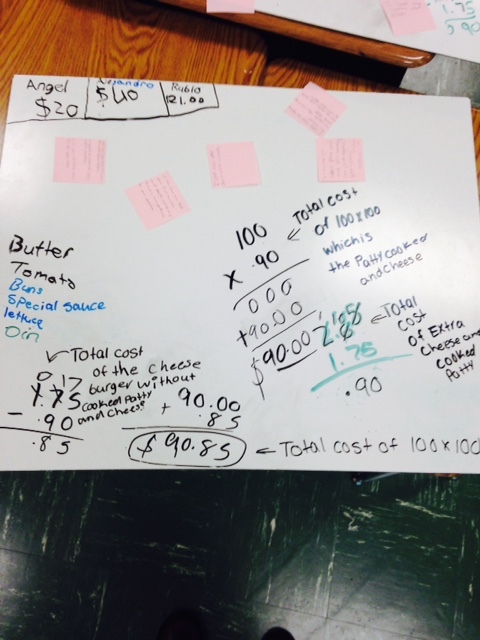 They reasoned, critiqued, made sense, and persevered. It’s almost difficult to believe that this class was a “remedial” class! Below, I’ve included a picture of each group’s final work. Finally, one of the conversations witnessed in a group was between a girl and a boy and should have been caught on video, but wasn’t. 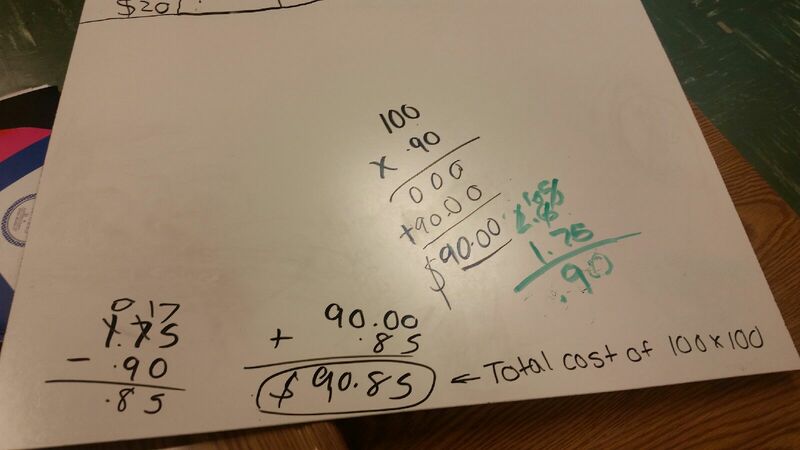 This group had an incorrect solution, but they were convinced they were correct, so to keep them thinking about the problem, I asked them how many dollars would be equal to the number of pennies in their answer (3,616). Girl: There are 100 pennies in a dollar. So 600 pennies is . . . Boy: So that’s . . . um. . .
Me: How does knowing 1,000 pennies = $10.00 help you. Girl: We have 3,000 pennies, so that’s $30.00. Girl: And the rest (16) are cents. $36.16! And they didn’t even need a calculator! Math really does make sense! So…Have You Always Taught Math This Way? I’ve been asked this question several times over the past 15 years or so. Most recently at a workshop I facilitated for middle school teachers. The short answer is no. My teaching has evolved. I strive to improve my practice every day. Below, is my response to the group of middle school teachers. When I first started teaching, I used what I learned in college about teaching mathematics – you know . 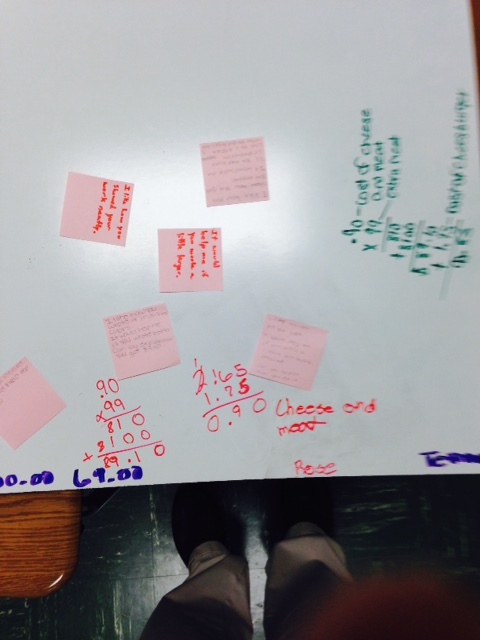 . . using manipulatives, group work, classroom discussions. All of those things that I still use today. But, when things didn’t go the way I anticipated, I seemed to always fall back on the way I learned which was primarily stand and deliver. At the end of my first year, I spent some time in my room, at my desk and wrote down all of the changes I wanted to make and how I planned to make them. This was probably the best idea I ever had! Throughout the summer I reread that list and, when necessary, created things that would help me reach my goals. I didn’t reach them all, but the next year was much more successful. Couple that with the summer PL that I took and the way I was teaching math was really beginning to change. One of the first changes I made was to incorporate children’s literature into my lessons. One of the PL’s I took that summer was a Marilyn Burns workshop where we learned that there are a tremendous number of books with mathematical connections. We learned how use the books to introduce mathematical concepts and problem solving, how to ask better questions, and one of my big “take-aways” was to listen more! Earlier this morning a man held up a GA-400 toll booth. His stolen getaway car broke down and he is now on the run with a 58 lb. bag of quarters. Several students as they entered the classroom: Mr. W., what’s that on the overhead? Me: I heard that on the radio this morning and wanted to know what you all thought and if you had any questions. Multiple student responses: “Oh, ok.” “That guy is stupid.” “What kinds of questions do you want? Me: Whatever questions come to mind. You can write your thoughts and questions in your journal. What I got from these 5th grade students at the beginning of class amazed me. They were totally engaged in the problem. The problem context had them so curious, they wouldn’t let go. How many quarters is that? 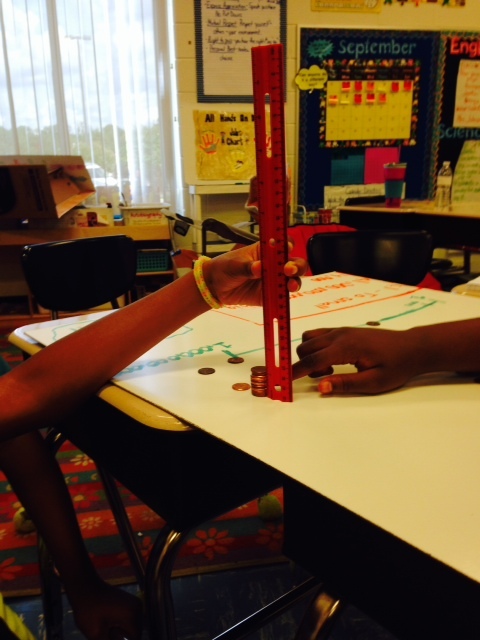 How tall would a stack of 58 lbs of quarters be? How far could you run with a 58 lb bag of quarters? 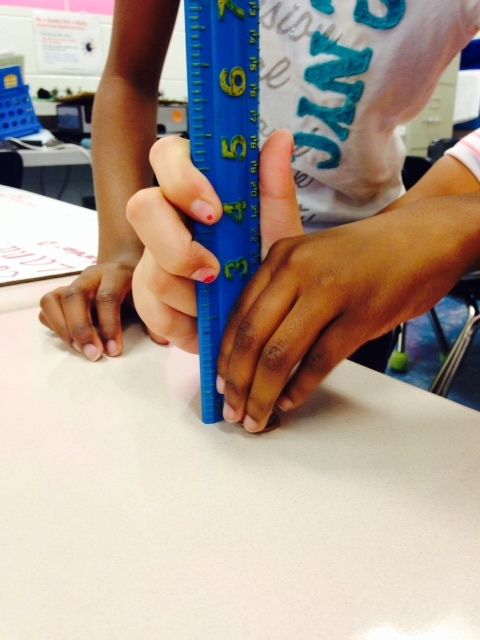 How big is the bag of 58 lbs of quarters? How long would a trail of 58 lbs of quarters be if they were laid end to end? 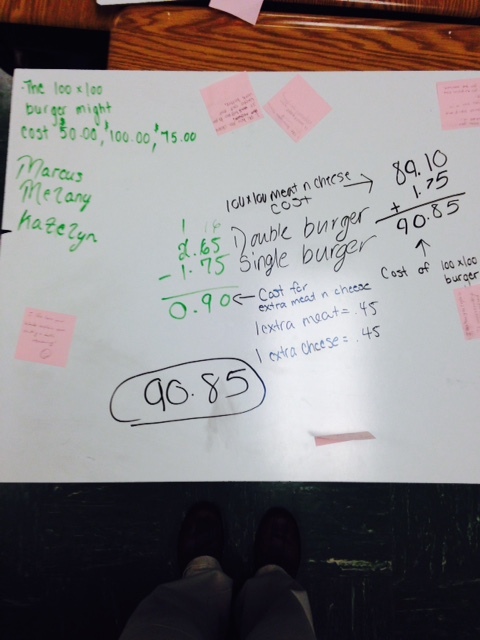 This one context from a morning radio show kept my students focused on the mathematical concepts of weight, length, decimal computation, and time for over a week. More questions came up as new ones were answered. They had developed not only a curiosity, but an intellectual need to know. This is what I had been searching for. A context that engaged my students in mathematics so deeply, that they wanted to figure out the answers to their own questions. It wasn’t easy to find stories like this back then. But now, they’re everywhere. Just Google bizarre news stories. Since then I’ve learned, along with a whole host of others (check out some of the people I follow), that I can create these contexts using all sorts of media to get the same results (3-Act Tasks). Below is a copy of the original context I used with my students. The image has changed over the years, but it is essentially the same document. And it works just as well today as it did 15 years ago! I just wish I had a recording of the news story! If you decide to use this, please share your experience. I’d love to hear about it! What could math teachers possibly have to learn from magicians? How could there be a connection between these two very different careers? Beginning with the last question probably makes the most sense. At an early age I developed a fascination with magic, sleight of hand to be specific. Any magician I saw perform – either on TV or live – filled me with wonder. Certainly, some of that wonder was directed toward how the trick or illusion worked, but even beyond that I wondered how I could learn to create this wonder in others. Since I was about 10, I have studied magic and about 7 years later I began performing magic shows at schools, for church groups, and even for a few holiday parties. Once I began my career as a teacher, my role as a magician changed and I focused most of my energy on teaching. I’ve lived the life of a magician and a teacher and over the last few years, and I’ve begun to notice the similarities between the two. A magician’s goal is to entertain his or her audience while bringing about a sense of wonder. The means for accomplishing this goal involves the use of any combination of a number of tools including misdirection, psychology, sleight of hand, and story telling. If a magician does his or her job well, the feeling of being tricked doesn’t really enter into a spectator’s mind. The big idea here is the creation of wonder. That’s the first thing teachers can learn! It doesn’t take a sleight of hand artist to build a sense of wonder in students. It takes some creativity and some work and dedication to the idea that all students deserve the chance to wonder and be curious. 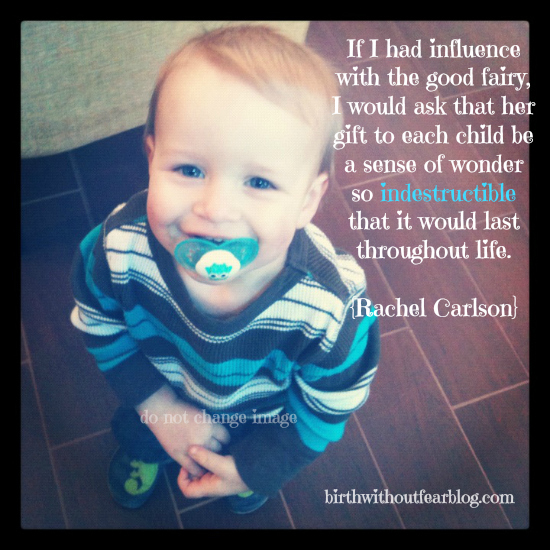 All students need that sense of wonder that builds inside them and creates an intellectual need to know and learn. This is a great time to be a teacher of mathematics. Evoking this wonder in students in math classes is extremely accessible because of technology and the online math community know as MTBoS. There are hundreds of math teachers out there at all grade levels and in all areas who have realized the power of making students wonder. We’ve all been creating 3-Act Tasks and sharing ideas on blogs and webpages, twitter, and youtube or vimeo. All for free. They’re there for everyone to use – because we’ve all learned, through using these tasks, that it helps us build student curiosity, engages them in the mathematics and in their own learning, and it helps us build independent, creative mathematical thinkers. Here is more about why you should use 3-Act Tasks. This brings me to the second thing we can learn from magicians: we can’t do this alone! If we work together, we all benefit! Most people probably think that magicians are private wizards who lock themselves in a room to practice and never share their secrets. That’s a bunch of crap! Magicians realized a long time ago that if they work together, they can work more efficiently and become more productive. Sometimes magicians work on a trick for a while, get stuck and then bring it to some friends they have in the magic community. These other magicians share their ideas, they brainstorm, and try possible solutions. Then they test the best solution on an audience. This can be very scary! Think about it. This is a trick they’ve never tried – they’ve practiced (A LOT), and maybe even performed in front of small audiences. They must be nervous! But they go out on stage or wherever their venue is and perform it. They have to! It’s how they pay their bills. Often, some of their friends who helped them are there to provide feedback. After several performances, and feedback, the script has been adjusted and the magic has been perfected, and it becomes a part of the magician’s repertoire. Now think about how many math teachers still work. . . alone, in their room, not sharing their ideas. Magicians realized this was not very productive a long time ago. Other professions did the same. It’s time math teachers realize this too! What I’ve learned through this whole process is that I get the same feeling of success when I create the sense of wonder in students as I did as a magician creating wonder in an audience. . . but it’s even better with students!